Honeybees are far and away the most important pollinator in today's agricultural landscape. They pollinate more than 400 crops worldwide, help to create about a third of the food we eat, and contribute an estimated $12 billion to our nation's food supply. All summer long, worker bees can be seen buzzing between flowers, collecting pollen and nectar and, in the process, pollinating vast tracts of crops (upon which we depend) and producing an abundance of honey (some of which is ferried away by beekeepers to local markets for us to enjoy). As summer draws to a close and the weather starts to cool, one of the questions I get a lot is, "What happens to bees in the winter?" People often guess that honeybees hibernate; others presume that colonies die as cold weather approaches. Fall's first frost does kill most members of bumblebee and yellow jacket colonies, leaving lonesome queens to establish new nests each spring. They've evolved a strategy for winter survival that is unique, one that relies heavily on frenzied visitation to flowers throughout the summer and a Herculean group effort in the months beyond. Believe it or not, their success in this endeavor depends on choices that you make for your yard and garden. Honeybees need their calorie-rich, carbohydrate-loaded honey to keep them alive during the winter; it's the perfect furnace oil for colonies. Worker bees eat this liquid gold and use the energy it provides to fuel rapid contraction of their wing muscles. Pumping these muscles without flying produces heat in the same way that shivering helps us to warm our own bodies. As temperatures drop, honeybees cluster together within their hive to share the warmth that their "shivering" generates (picture a ball of bees a foot in diameter and sliced through by sheets of honeycomb). At the core of this cluster, worker bees keep themselves and their queen at a temperature that is only a few degrees lower than that of a healthy human. The cluster's outer layer consists of tightly packed, slightly cooler workers that insulate the core as effectively as bird feathers or mammalian fur--don't worry, everyone gets to rotate. This remarkable group behavior allows honeybees to keep the inside of their home virtually tropical while the rest of the natural world remains frozen beyond the hive's walls. • Plant late bloomers. When it comes to enhancing your garden's fall bloom, consider adding late-flowering plants like goldenrod and asters that are critical to a colony's final push to bring home food for the winter. • Avoid systemic pesticides. Certain pesticides have toxins that invade all plant tissues (instead of just living on the plants' surface), and bees bring these chemicals to their nests when they collect nectar and pollen. 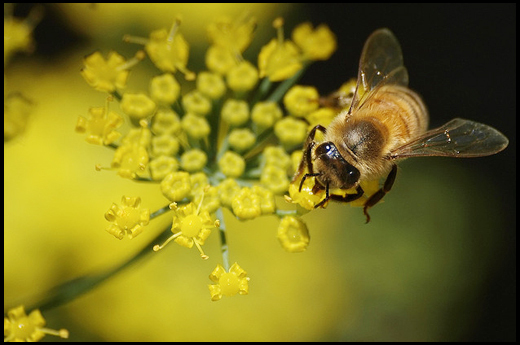 A group of chemicals called nitroguanidine/neonicotinoids has been shown to contribute to colony collapse disorder. • Encourage early-spring blooms. 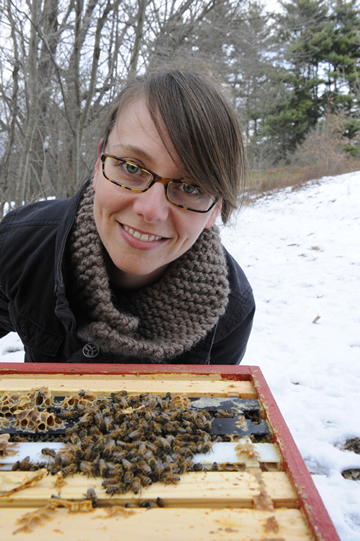 Spring brings welcome relief for honeybees with a chance to restock dwindling floral supplies. Flowering trees--willows, maples, and the like--provide some of the earliest opportunities for bees to forage, so try to encourage their toxin-free growth when you can. Like us, bees use their social skills to get through tough times. Our food supply rests on their success, so knowing how honeybees can achieve it, and how we can help, brings us one step closer to maintaining our strong working relationship--which means healthier crops, greater variety in our diet, and an abundant honey supply for all. Do you keep bees? Tell us about it on Facebook.